Benchwarmers Bagels & Coffee will officially open to the public at 7am Thursday, February 7th, inside the beautiful Transfer Co. Food Hall at 500 East Davie Street. From then on, the shop will be open 7am-2pm on Thursdays and Fridays, and 8am-3pm on Saturdays and Sundays. They will soon expand to be open on Tuesdays and Wednesdays as well. Benchwarmers is a collaboration between Josh Bellamy and Sam Kirkpatrick of Boulted Bread and Andrew Cash of Jubala Coffee. Their story began almost four years ago when head baker Josh Bellamy began to dream of applying the guiding principles behind his dark, rustic loaves to an uncharted medium. 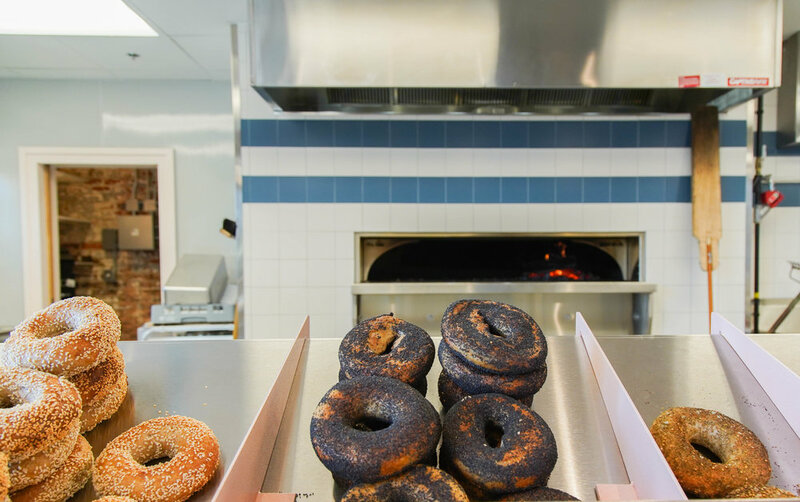 Benchwarmers uses a wood-fired oven, heirloom grains, extended fermentation, and fresh-milled, pre-fermented flour to make every bagel the very best version of itself: light and open but with serious depth of flavor. Their coffee is driven by the same fundamentals, using precise, intentional craftsmanship and the best sourcing available. They make cortados, iced flash brew, and long shots of espresso that are fit for the best coffee shop in town, but they also make more playful drinks with the same level of care (the Salted Butterscotch Latte, for instance). Their drinks embrace high-browed coffee shop methods but, in hand, they feel unpretentious and just plain fun. In that way, Benchwarmers is not a bagel shop that serves coffee or a coffee shop that serves bagels, because the two go hand-in-hand. Each one needs a partner to dance. Raleigh already has a handful of world-class coffee shops and breakfast restaurants, but Benchwarmers is both. Their counter offers a single, cohesive experience that does not focus on one core element to the neglect of others. Instead, it is simultaneously chef-driven, barista-driven, baker-driven, and community-driven. Their sandwiches are possibly the best expression of that collective identity. The short menu is bold and creative but with common-sense offerings that feel friendly and familiar. That menu is the work of Chef John Knox, formerly the Executive Chef at Vin Rouge in Durham. Knox combines a Southern upbringing with formal French restaurant training, which is evident in his creations. If you’re feeling fancy, they’ve got house-cured lox and duck rillette and cappuccinos. If you’re not, they’ve got fried bologna and marshmallows and pimento cheese. You can grab a sandwich and a latte for here plus a dozen bagels with cream cheese to go. Their name, Benchwarmers, is a nod to Sam, Andrew, and Josh’s undiluted love for childhood sports. As kids, they played basketball, baseball, and soccer with their hearts on their sleeves. Even if you know you won’t be an athlete, it’s still so fun to play. This shop is meant to remind them of that feeling and the three things parents always tell their children: Try your best. Don’t take yourself too seriously. Remember to have fun. The space -- warm, humble, and vaguely nostalgic -- is nestled in the southernmost corner of the new Transfer Co. Food Hall, between Locals Oyster Bar, and Che Empanadas, a short walk from Burial Beer Co. There is space to spread out, meet with friends, get some work done, or just let your kids run in circles. We cannot wait to feed you.